I have a confusing ticket. 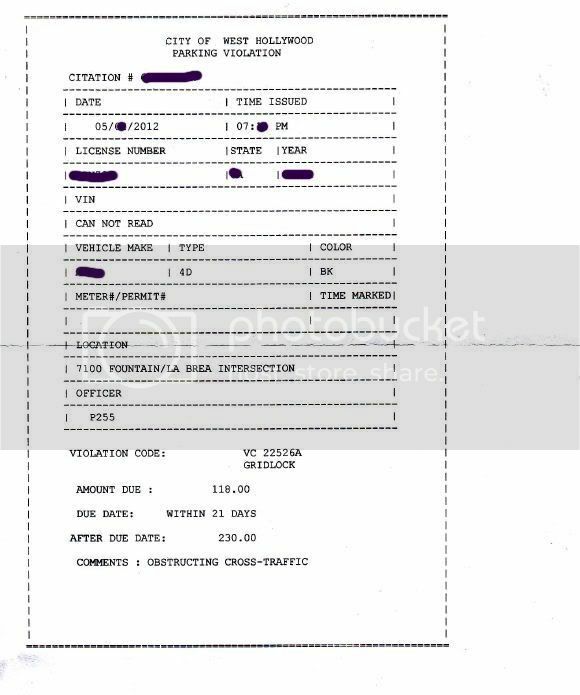 West Hollywood sent me a gridlock "parking citation" from a red light camera. As I understand it, the best way to fight a red light ticket here is to ignore it, ignore the warnings, ignore the collections calls, and then it goes to Los Angeles Superior Court where they refuse to enforce the ticket and bury it. As long as you don't ever contact them, it goes away. This is different and I can't find any information on a similar instance. The car in front of my car is shown, stopped, with brake lights, for no reason. The street continues for a a couple hundred yards, wide open, with my car stuck behind him. Here's the law on Gridlock. Any advice? I would love to ignore this and move on. I don't have much faith in fighting tickets here. There is no reason to believe my car could not proceed through the intersection. 22526. (a) Notwithstanding any official traffic control signal indication to proceed, a driver of a vehicle shall not enter an intersection or marked crosswalk unless there is sufficient space on the other side of the intersection or marked crosswalk to accommodate the vehicle driven without obstructing the through passage of vehicles from either side. Well, it doesn't really go away.. Fact is, even if it is unenforceable, there are no provisions to just make it go away. Unless they enact a new law that it shall be removed from your record, it'll be on there, longer than you and I will be around! And with that, this is one that I would actually NOT ignore. I would fight this one! 40518. (a) Whenever a written notice to appear has been issued by a peace officer or by a qualified employee of a law enforcement agency on a form approved by the Judicial Council for an alleged violation of Section 22451, or, based on an alleged violation of Section 21453, 21455, or 22101 recorded by an automated enforcement system pursuant to Section 21455.5 or 22451, and delivered by mail within 15 days of the alleged violation to the current address of the registered owner of the vehicle on file with the department, with a certificate of mailing obtained as evidence of service, an exact and legible duplicate copy of the notice when filed with the magistrate shall constitute a complaint to which the defendant may enter a plea. Preparation and delivery of a notice to appear pursuant to this section is not an arrest. There are no other California Vehicle Code provisions that I know of to enforce any other violations via photographic evidence! And since I cannot find 22526 listed there, that citation is invalid and must be dismissed! (Fact is, it shouldn't even be filed in court - so I suspect this maybe a fishing expedition). This is pretty simple, basic and should result in a dismissal at the arraignment. And like I said, it would be one I would challenge rather than ignore. The risk is, if you get a hard headed judge who wants to enforce it, or one who won't dismiss at the arraignment or one who has no clue! So there are risks involved and I don't know if you want to take them. With that being said, does it say to "contact the court" or does it say "Do Not Contact the Court"??? Thank you! 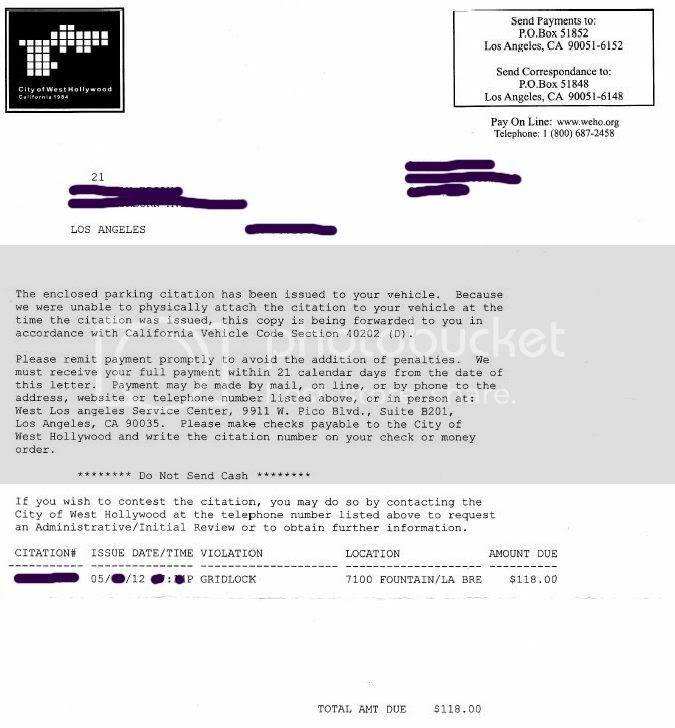 It does not mention contacting court but either City Of West Hollywood or West Los Angeles Service Center (the office for parking violation dispute hearings). Give me some time and I'll look into it. Unless someone else wants to chime in! Edited to Add: If It is possible if you can cover up all your personal info, and either scan the front and back of the citation or take pictures (like maybe with your cell phone) and then upload them to www.photobucket.com and post the links to the images here, it might make the information hunt much easier. Much appreciated and, yes, it's fishy. The back is a Declaration Of Non-Ownership. The other page is a b/w scan of my car at the intersection with close-up of license plate. But does the picture show you physically in the intersection (??? ?brake lights on???)? Or are you simply driving through? More importantly, does it look as if this was a picture taken by parking enforcement? Or is there anyway to tell if it was taken by an automated system? Also, at approximately what time of day/night did this grid-locking allegedly happen? Any idea? (Obviously these images might be outdated) I know that West Hollywood still has red light cameras at Fairfax and Santa Monica, as well as La Brea and Santa Monica.... I also get a "red light camera alert" as I drive by Fairfax and Fountain (the blue poles)... But do they have one at La Brea and Fountain as well? (The Google Street Image -Dated March 2011) shows they do but I don't ever remember seeing it). 40202(d) If, during the issuance of a notice of parking violation, without regard to whether the vehicle was initially attended or unattended, the vehicle is driven away prior to attaching the notice to the vehicle, the issuing officer shall file the notice with the processing agency. The processing agency shall mail, within 15 calendar days of issuance of the notice of parking violation, a copy of the notice of parking violation or transmit an electronic facsimile of the notice to the registered owner. But I don't think this is what is happening here. I think they have the cameras set up in a way where they are snapping pictures of vehicles that are grid-locking the intersection during rush hour, and pretending these were issued by parking enforcement, when in fact these were issued by "automated enforcement methods" and THAT would be in violation of the provisions allowing automated enforcement, the citation would be invalid and it would then have to be dismissed. Question is... How to find out one way or the other!!! I know they have been doing something similar in San Francisco... And I'll look into that and hopefully use it as an off shoot into figuring out what these guys are doing down here. My car is in the intersection, with brake lights. Does that mean my car is stopped? Who knows? I can clearly see that the car in front has brake lights but with clear space in front. I took another look at the picture they sent and it does seem to be from a lower angle (see below). I found the other page that lists an officer number. If there was an officer, go ahead, come over, and ticket the car. If human, I don't understand why they didn't. According to the ticket, they shot the picture in the 7pm hour. The Fountain/La Brea intersection does have red light cameras. At first, I thought it was a snitch ticket... But I think we have already established this one a completely different animal. For one, those are moving violations issued on a Notice to Appear, an appearance in court is required... This one is issued by parking enforcement, no court appearance is involved, no violation points are assessed upon conviction. I think the general plan here is to issue these citations and hope whoever receives them is oblivious to what is up.... Write the check and mail it in. For the few that may dispute them, reject their first appeal, reject their second appeal... And if that person happens to decide to go to court (I think they are charged the $25 if they lose).. But for every one that is contested where they have to pay the $25, there are probably a few that they collected $118 on.. or maybe even one of those few will go late and owe the late fee in addition to the $118.. Total if it goes late? $230 That will pay for 9 court losses! West Hollywood used to collect in upwards of $8 million every year from Red light cameras. Now that L A County Courts will not enforce those citations, they've got a lot of making up to do! And I bet you this is one of them! Let me get this out of the way... The vehicle Code apparently authorizes the use of Video Imaging of Parking Violations, however, that is strictly for "Parking Violations Occurring in Transit-Only Lanes", and ONLY the City and/or County of San Francisco are authorized to use it. West Hollywood has no authority to utilize such a a program and even if they did, the program does not authorize such use to issue VC 22526 grid-lock violations. You can read the details under VC section 40240 through 40243 which you can find HERE. 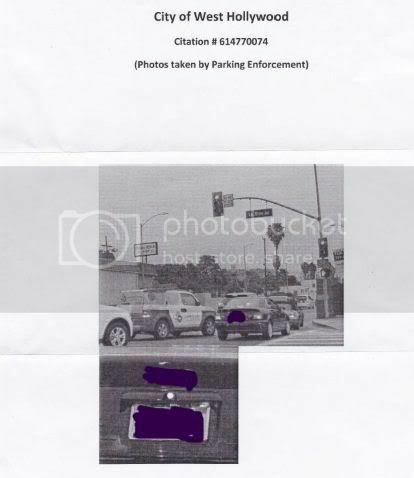 Also, there is another authority under the Vehicle Code that allows any city, or county to use "Photo Enforcement and Digital Photographing of Parking Violation During Street Sweeping", but that ONLY allows such use for the violations as described; and whether West Hollywood has signed up for such program is really not relevant here simply because the program does not authorize issuing VC 22526 gridlock citations using photo evidence. I should also add that several parking enforcement agencies have recently started using digital photography to document parking violations, and mostly for violations where the driver might not wait for the notice to be issued. Happens in "No Stopping Zones" but in theory, it can happen with any type of parking violation. It is important to keep in mind that as afar as evidence, I personally think that those photos will not hold up in court simply because the vehicle code does not authorize the use of imaging to document such violations. And to be able to authenticate such photos, they must be a lawful authority allowing their use. So why do they use them? Well, because the first two levels to contest a parking citation are often through an administrative hearing (first in writing and then in person), and the rules of court do not apply. So parking enforcement can say "pictures are good enough proof"... The citation is valid, pay the fine. It is often only at the third level of contesting the citation, that you can get the matter heard in a court of law, where a judge or a commissioner hears the case and decides. In this case, it goes to the Beverly Hills Superior Court. My car is in the intersection, with brake lights. Does that mean my car is stopped? Who knows? I can clearly see that the car in front has brake lights but with clear space in front. I took another look at the picture they sent and it does seem to be from a lower angle (see below). I'm not sure I understand what you mean by “lower angle”... Lower angle than what? If there was an officer, go ahead, come over, and ticket the car. If human, I don't understand why they didn't. Well, the contention is that if the officer had attempted to issue a citation and either place it on the vehicle or hand it to you, you would have been gone by the time he wrote it. And by the way, note the 15 day condition. If the date the citation was MAILED (postmarked) longer than 15 days from the date of the violation, then the notice of parking violation is defective and you can dispute it that way. If it is not, then you still have what I believe is a GREAT defense argument that should get this thing to go away. I cannot make any guarantees, and you may have to take it all the way to the level where you go to court before a judge, and in reality, that is where this defense is most likely to work for you. I'll give you a sort of a brief detail and if you plan on going with it, then you can start with the first level (written appeal) immediately if you choose. So, I think we all understand what the prohibition is... Do not enter the intersection unless and until you can ensure that there is enough room for your vehicle on the other side of the intersection; the purpose for all this is simply to avoid having you obstruct the through passage of vehicles from the other side... The “other side” here clearly means northbound and south bound cross traffic on La Brea. You should note that nowhere in that code section is the color "red” mentioned... not even once. It does talk about “an indication to proceed” but what is "an indication to proceed"? Its a green light. So what is the element of the offense for VC 22526? What action or lack thereof must they prove to sustain a guilty finding? The element of the offense of a 22526 is that you entered the intersection, could not make it through on the other side, and you obstructed the through passage of vehicle from the other side. In your case, while traveling eastbound on Fountain, and in the position you were in when the picture was taken, you could not be obstructing Southbound traffic on La Brea... You were already past that point. So what about northbound traffic? Well, at the moment the picture was taken, there does not appear to be any vehicles that were waiting for you... Meaning, there is no evidence that you were obstructing traffic, at least not at the moment the picture was taken. And if the cannot prove that you obstructed traffic, then how can they prove the elements of 22526 were committed? Some may say... Nahhh, clearly, the law prohibits you entering the intersection or crosswalk if there is no room for you on the other side of the intersection or crosswalk. OK, no argument there, but without the last sentence, specifically, “without obstructing the through passage of vehicles from either side”, what is the purpose of that law... Nothing! I mean if blocking cross traffic was not the one basic issue the law was looking to prevent, then why do we call it the “anti-gridlock” law??? As for blocking the crosswalk, well, this is not the statute for that. VC 21970 covers the blocking of a crosswalk. Wikipedia defines “Gridlock” as “The term gridlock is defined as "A state of severe road congestion arising when continuous queues of vehicles block an entire network of intersecting streets, bringing traffic in all directions to a complete standstill; a traffic jam of this kind. "The term originates from a situation possible in a grid plan where intersections are blocked, preventing vehicles from either moving forwards through the intersection or backing up to an upstream intersection”. Point is, without the obstruction, there is no gridlock and hence there is no reason to enforce that code section. Very helpful, thank you. I will dispute it all the way through to court, if necessary and we'll see where this goes. By lower angle, I meant maybe it's street level and not from the red light camera? I still say, if it was an officer, he/she could easily have stopped my car. As for the car in front of mine needing to merge, there's still a block of space in front of him. There is no reason to stop there and no reasonable expectation of that happening by the car behind him.